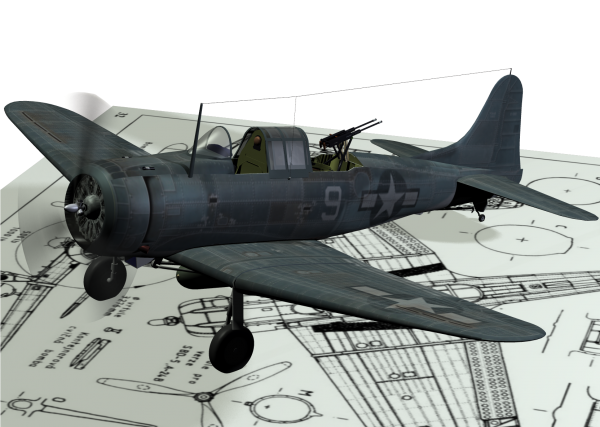 The first one for 2013, The US Navy / Marine Corps premier Divebomber....Modeled in Wings3D, packed for Poser parts in .3ds for other apps. A set of 3 textures for USS Yorktown plus a couple of others. The usual gear up / down , folded wings, mahine gun and bomb options...hope you like it & Happy New Year!....Neil. suzukishinji (2 years ago) Inappropriate? Stezza (6 years ago) Inappropriate? you have some great models.. thankyou for sharing your talent.. Q. Do you have a Vultee Vengeance dive bomber? Your aircraft models are awesome. Thanks for sharing your talent with us! Great work. Thanks! billewey (6 years ago) Inappropriate? Saw the last flying SBD2C at an airfield in Pearland, TX. It is normally stationed in Grahm, TX. It looked great. Excelent model,very impressive,and well detail,thanks for sharing! mrvet (6 years ago) Inappropriate? Neil Wilson (6 years ago) Inappropriate? STORMnl (6 years ago) Inappropriate? My time as a Navy pilot started soon after WWII. My affections for the planes began before that. I can still hear the high pitched whine coming from the SBD2, we called them SB Deuces, when they were in a dive. graykeeper (6 years ago) Inappropriate? Remarkable textures!!! While the Navy may have had specifications for aircraft colors they rarely looked like they were supposed to after some time in combat. These models look like they have been at sea for a long time and are probably the most color accurate Navy planes I've seen! Thank you! Oops! That comment should have been for your TBF Avenger. Totally amazing work!! Model and textures are brilliant, Superb detail, Cheers Neil!! Nachtgänger Productions (6 years ago) Inappropriate? Thanks Neil, great work as always. kavon (6 years ago) Inappropriate?